Our overall goals are to design, chemically synthesize, and characterize pharmacologically new agonists and antagonists for the four subtypes of adenosine receptors (ARs) and eight subtypes of P2Y receptors and to explore their potential for treating human disease conditions. 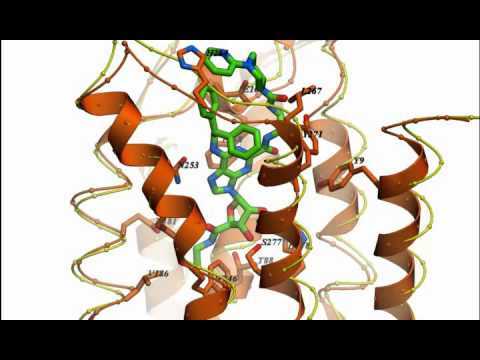 I am a medicinal chemist with interests in the structure and pharmacology of receptors and in developing drugs that act as agonists or antagonists of G protein-coupled receptors (GPCRs). My current focus is on receptors for purines, encompassing both adenosine receptors and P2 receptors, which are activated by ATP, UTP and other extracellular nucleotides. My lab has taken an interdisciplinary approach to studying the chemical and biological aspects of these receptors. We have used convergent modeling, mutagenesis and structure activity approaches to gather information about the three-dimensional structure of the receptors and its relationship to binding and activation functions. The determination of the X-ray crystallographic structures of the P2Y1 receptor and an agonist bound A2A adenosine receptor by our lab in collaboration with Ray Stevens of Scripps Research Institute is providing a new path to designing drugs that act at these receptors. We have developed a functionalized congener approach to drug design that permits inclusion of reporter groups such as fluorophores. Novel ligands (small molecules) for these receptors are developed using classical synthetic approaches and also by semirational methods based on molecular modeling and template design. Receptors are computer-modeled by homology to GPCRs of known structure, and the models for ligand recognition are tested and refined using site-directed mutagenesis of the receptor proteins. Recently, the involvement of extracellular loops of GPCRs have been implicated in the receptor binding of small molecules. We are interested in correlating structure of receptors and small molecular drugs with pharmacological properties. Substances developed as potent and selective agents acting through adenosine and P2 receptors have proven useful as pharmacological probes and have potential for treating diseases of the central nervous system, immune system, and cardiovascular system. Recent accomplishments include the design and synthesis of the highly potent and selective A3 adenosine receptor agonists and antagonists, using a combination of library screening and optimization of known adenosine receptor ligands. These substances have been shown to be effective in models of treatment for glaucoma, cancer, stroke, and cardiac ischemia. Two selective A3 adenosine receptor agonists developed in our laboratory are currently in clinical trials for hepatocellular carcinoma, glaucoma, psoriasis, and rheumatoid arthritis. We recently published in collaboration with Daniela Salvemini of St. Louis University the protective effect of A3 agonists in animal models of neuropathic pain. This condition can accompany treatment with cancer chemotherapeutic drugs. Thus, A3 agonists could potentially reduce this side effect and allow the life-saving anti-cancer treatment to continue. We have discovered highly specific A3 agonists that reduce neuropathic pain in the mouse and rat and prevent its development. We recently found an A1 adenosine receptor agonist that has antiseizure effects in mice without some of the side effects associated with such agonists in the past. We have synthesized the first P2Y1 receptor-selective antagonists through functionalization of adenine nucleotides. The antagonists were optimized with the aid of receptor homology modeling. These substances have been shown to be effective in models of anti-thrombotic treatment, due to blockade of the proaggregatory effects of ADP. The pharmacological probes designed in our section have been used to demonstrate the connection between purine receptors and apoptosis (programmed cell death). A3 adenosine receptor agonists at low concentrations and P2Y6 receptor agonists have antiapoptotic effects. Furthermore, P2Y6 agonists promote insulin release in pancreatic islet cells. We are currently exploring the role of various P2Y receptors in the mouse. Another potential method of using the protective effects of AR activation has been achieved through receptor engineering. Constitutively active mutant A3 adenosine receptors, in principle, could be delivered by tissue-targeted vectors for gene therapy. In addition, we have introduced the approach of neoceptors, also intended for eventual use in gene therapy, in which the putative agonist binding site is redesigned to accept only agonist molecules altered in a complementary fashion. Insight into the recognition of agonists by the receptors may be gained using site-directed mutagenesis and molecular modeling. We are exploring this approach conceptually with tailor-made agonist ligands (“neoligands”) that are selective for the neoceptor and not the native receptor, in combination with receptor mutagenesis. The neoceptor concept has so far been applied to A1, A2A and A3 adenosine receptors. Our selective receptor ligands are used as pharmacological probes of the role of extracellular nucleosides and nucleotides in the brain and in peripheral tissues. More than 35 compounds from our lab are available commercially as research tools and are used to advance research in hundreds of laboratories (PDF, 117.3 KB) . Our own internal studies and outside collaborations include studies of the role of these receptors, and possible treatments for, thrombosis, Parkinson’s disease, inflammatory diseases, cancer, diabetes, chronic neuropathic pain, and epilepsy. The relationship between drug structure and biological activity requires further probing. The study of GPCRs, including purinergic receptors, provide promising avenues for the development of new drug therapy for treating chronic diseases. I am interested in a basic control system in the body that has relevance for the treatment of diverse diseases and chronic conditions. This system is regulated by signaling molecules outside the cell that act by homing in on specific proteins on the cell surface called receptors. We mimic or block these signaling molecules with compounds synthesized in our lab to target the receptor. When such a compound adheres to its receptor it gives a command to the cell to either initiate or suppress specific biological actions. These signaling molecules are related to adenosine and ATP (adenosine triphosphate, the “energy currency” inside the cells), which occur naturally and are released by cells. Adenosine can be produced as a breakdown product of ATP. Adenosine is present in the medium surrounding all cells in the resting state, but its concentration outside of the cell rises dramatically when stress to an organ or tissue occurs, such as insufficient oxygen and inflammation. Adenosine and ATP-like molecules act as important modulators of the activity of every organ in the body and are relevant to a wide range of physiological processes, from the central nervous system to the immune system and the endocrine system. The adenosine receptors (ARs) are important control elements in maintaining health, often acting as a means of correcting an imbalance in the body or responding to a physiological need, such as delivering more blood to cardiac muscle in distress. Adenosine acts in several ways to correct the “set point”—a level that is normal in a tissue and that the body tries to maintain, like a furnace keeps a set temperature. We are designing, preparing and studying new chemical compounds that bind to these receptors both as research tools and potentially as novel therapeutics. For example, activators of one of the four members of the AR family, called the A3 subtype, which were invented in our lab, appear to be effective in clinical trials for treating autoimmune inflammatory diseases (rheumatoid arthritis and psoriasis) and primary liver cancer. My team uses many different tools in its work—including computer models, chemical synthetic approaches, and genetic methods to probe how molecules behave. We are also developing methodology, such as fluorescent tracer compounds, for screening molecules in the discovery of new pharmaceutical lead molecules. We also use mutagenesis of the drugs’ protein targets changing genetic information in a controlled manner—to produce a desired mutation. For example, we may alter a receptor in order to test if a compound may have a therapeutic potential. Altogether, we use biology, chemistry, and computer technology to study the chemical and biological aspects of receptors. As chemists, we can synthesize new molecules of interest that are designed to have particular characteristics. We can then test these new molecules in biological systems. We often base these new molecules on compounds that are known to have an effect on multiple biological targets. Our general goal is to make these compounds more selective so that, instead of having an effect on multiple biological targets, they only have an effect on a single type of receptor. Sometimes the receptor can be activated in a nuanced fashion to activate only certain processes inside the cell and not others normally associated with that receptor. New compounds that produce this type of activation, called “biased”, is also within the scope of our research program. We often obtain clues about the structure of new compounds that do a specific job in the body from compounds that are already known in that context. We can improve upon the effectiveness of the natural substance. Other times, we discover the potential of a molecule from an unrelated class to fulfill this biological need. We then make them more selective and potent by changing the chemical structure appropriately in a systematic fashion. So we know the effects on the activity of changing specific parts of the molecule – and this can sometimes be predicted by computer modeling. Some of our new molecules demonstrate beneficial effects in cell or animal models of disease and therefore we consider how to advance these compounds toward clinical use. Usually we base this work on a concept that is so innovative that the pharmaceutical industry would consider it too risky to touch. Thus, our basic research can eventually have a practical outcome to benefit patients. This is very challenging, because of the complexity of interactions of new molecules in the body and the many way in which lack of side effects and other safety criteria must be demonstrated. Compounds my lab develops could help in the treatment of conditions such as glaucoma, cancer, stroke, thrombosis, cardiac ischemia and diabetes, in addition to diseases mentioned above. Engineering of selective ligands for mechanistic probing and therapeutic modulation of adenosine and P2Y nucleotide receptors. The newly determined structure of the A2A receptor for adenosine is shown surrounding its synthetic agonist.